GAZIANTEP — The divisions between the Syrian regime and rebel factions are not only reflected on the battlefield, but also in the classroom, with school curricula ranging from Baathist textbooks to Quran classes. Schoolchildren in government-held areas continue to follow the official Ministry of Education curricula taught in schools across Syria before the conflict began in March 2011. But curricula adopted in opposition areas have chosen to follow other standards. 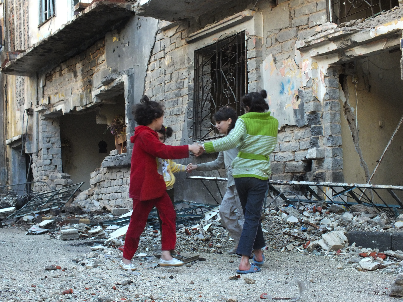 Save the Children reported in July that over one-fifth of Syrian schools had been destroyed or made unusable by the war. The majority are located in opposition areas. According to UNICEF, nearly 2 million, or 40 percent of Syrian children, have dropped out of school since the conflict began. Some opposition areas have chosen to follow models developed by the National Higher Commission for Learning and Higher Education, the education arm of the Syrian National Coalition, the official opposition-in-exile. These are nearly identical to those created by the Syrian Ministry of Education. But changes have been made to reflect the opposition’s rejection of the regime of President Bashar al-Assad and his father and predecessor Hafez al-Assad. Jihad al-Khatib, head of the Educational Department of the National Higher Commission for Learning and Higher Education in Idlib province, says that the subject of National Education, which includes some teachings and principals of Assad’s Baath Party, has been cancelled. Book covers and logos alluding to the Assad regime have been omitted from textbooks, while historical events have been reexamined (the 1963 March 8 Revolution, in which the Baath party military leaders seized power, has been renamed the March 8 Coup.) Quotes and symbols of the ruling regime have been replaced by those of the opposition. But some of the bodies responsible for schools in opposition-controlled areas have chosen not to adopt the curriculum of the SNC, arguing that it is safer and more practical to stick with the government one. Farah pointed out that the chosen curriculum does not include any religious or political sections aside from they the National Education class, which has been cancelled. To compensate, they have implemented a new subject called Civil Education. “Through Civil Education we aim to teach the children the basics of building civil society and achieving its goals,” he said. “This subject, which is absent in the Syrian curricula, is taken from the curriculum of the Palestinian Authority (PLO) and is being taught for all school levels,” he said. The school also distributes pamphlets for raising awareness about arms and violence in the society. But not all schools are adopting secular curricula. In some areas of Syria that have fallen under the control of the Islamic State in Iraq and Syria (ISIS), schools are now teaching strictly religious-based courses. A local activist in Idlib said that ISIS, al-Qaida’s Syrian arm, has opened educational centers called teach-ins in which foreign jihadis teach the Quran, the sayings of Prophet Mohammad and Islamic studies. Farah noted that some 150 students who once attended teach-ins in Deir Ezzor suburbs have since enrolled in Isham School, of which he is the manager. The administrators preferred not to ask the students’ families about the reasons behind leaving the teach-ins. He believes that those students’ parents want their children to learn math, physics and literature, not only religious teachings.